Roz & Livvy have trained hundreds of puppies over the years and are here to help you get it right with your pup. 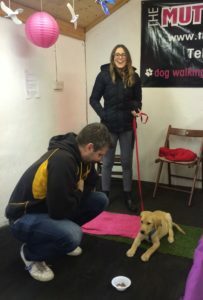 They frequently attend courses and workshops to hone their training skills, including the intensive 7 day puppy instructors course with Chirag Patel. Prepare for your puppy and get all of your questions answered in a one-one session (For eg Crate/puppy pen training, toilet training, what to do on the first night you bring your puppy home, diet, exercise, chewing/biting and preventing jumping up at people). We can even help you choose the appropriate breed/type of puppy for your needs if you have not yet chosen your puppy. Price: £48 per hour including VAT. Phone consult:£38.00 per hour including VAT. We can help with typical puppy problem behaviours such as jumping up, biting, recall, toilet training, stealing food and pulling on the leash. We come round to your home and give you practical guidance on how to deal with these problems in a kind way that will enhance your relationship with your puppy. Price includes £5.00 discount off our puppy training course, our book on common puppy problems, notes emailed to you after the session. Puppy Package: £150.00 including VAT for three one hour sessions. Price includes our book on all the common puppy problems, notes recorded during the session or emailed to you after. Ultimate Puppy Package: £215.00 includes 3 x 1 hour sessions and place on foundation puppy course. Foundation puppy class (usual price £78.00) includes 5 x classes, book on puppy training and training manual which includes video tutorials. Plus a goody bag worth £15. Missed out training class and want to join in on the advanced puppy classes? You can catch up in some one-one sessions with us, a minimum of two are required to join our advanced class. On these sessions we cover all of the exercises in our puppy foundation course enabling you to slot into the advanced course with ease. Notes recorded during the session or emailed to you after. Price includes puppy book, training manual and emailed notes after each session. Silver Advanced Puppy Package: £155.00 including VAT for two one hour sessions and a place on the next available advanced puppy class course. Gold Advanced Puppy Package: £190.00.00 including VAT for three one hour sessions and a place on the next available advanced puppy class course. One-one’s are usually £55.00 per session. Advanced class are usually £60.00 and include 4 x classes, hand outs, video tutorials. NB: We require payment for the advanced puppy course along with payment for these sessions to ensure discount is not given to those not attending the advanced course.